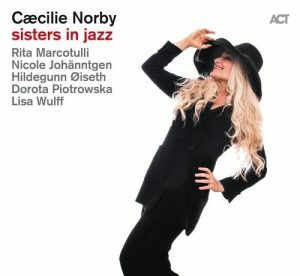 Following Danish Jazz singer Caecilie Norby ever since her 1995 Blue Note debut has always echoed my attitude towards repertoire. I think if you’re not choosing to record your own original material, it is utterly important to come up with the right combination of cover tunes and not simply an amalgamation of songs from the Great American Songbook and standards. For example, her debut included a wonderful interpretation of “By The Time I Get To Phoenix” and her second Blue Note album “My Corner Of The Sky” (1996) included a marvelous take on “The Look Of Love”. She released an all-original album in 1999 (“Queen Of Bad Excuses”, Blue Note) and another one in 2005 (“Slow Fruit”) and since then has recorded songs by The Police, Michel Legrand, Abbey Lincoln, Leonard Cohen, Tom Waits, Bob Dylan, Paul Simon, Joni Mitchell, and David Bowie. Her latest, her fourth on the German ACT Music label, finds her singing tunes by Betty Carter, Mitchell (two tracks), Nina Simone, Carole King, Lincoln, Rickie Lee Jones, and Ann Ronell. Yes, they are all female composers, as are all the players on the album, and thus the release means perfect timing in more ways than one. “There is no doubt that strong, competent female musicians are underrepresented on the music scene! Nor is there any doubt that they exist!”, Caecilie writes in the liner notes. It’s what jazz festivals like the Winter Jazzfest in New York has been trying to get across in the last couple of years and the Berlin Jazz Fest as well with its programming. Thinking it further, I think it would have been appropriate to have women as producers and arrangers here too (half of the album’s tunes were arranged by men). Having German saxophonist Nicole Johänntgen on board is no mean feat; her robust sound owes a lot to Ben Webster at times. Italian pianist Rita Marcotulli (also an ACT recording artist) not only shows her versatile skills on both ballads and uptempo numbers, but as a composer too. Hildegunn Oiseth on trumpet, Lisa Wulff on bass, and Dorota Piotrowska on drums all add up to some exciting paths. And percussionist Marilyn Mazur joins the sisters on four tracks. The album opens with a pretty cool and loose “Easy Money”, from Rickie Lee Jones‘ debut album and continues with a dapper version of Ronell’s “Willow Weep For Me”. There is too much going on I think on Betty Carter‘s “Droppin’ Things” and it just reaffirms me that bopping tunes like this have never really clicked. One of two Mitchell compositions, “Man From Mars” works much better. I think more narrative/conversational styles like on this tune suit her more (the other Mitchell track, “Big Yellow Taxi”, gets a fairly solid, slightly restrained treatment) and Rita’s piano work is simply stunning. The same applies for Abbey Lincoln‘s “Love Has Gone Away”. Beautiful texture and Caecilie has rarely sounded better than on this sad piece. Caecilie tackles Bonnie Raitt‘s “All At Once” (from “Luck Of The Draw”, 1991) in haunting, almost somnambulant style; Carole King‘s “Will You Still Love Me Tomorrow” is super sweet (her arrangement is really beautiful) with Rita again sparkling over the keyboard, and Nina Simone‘s bluesy “Do I Move You” is nearly tempting me to answer “No, not really”. Of the original compositions, “Naked In The Dark” is a freely swinging piece, “First Conversation” another fine ballad in typical Caecilie style (also the title track of her fourth and final Blue Note album in 2002) with great trumpet playing, and “Puzzled”, the piece she wrote together with Marcotulli, comes across as more of a gimmick. Caecilie and her european sisters in jazz play all over Scandinavia in February and March.